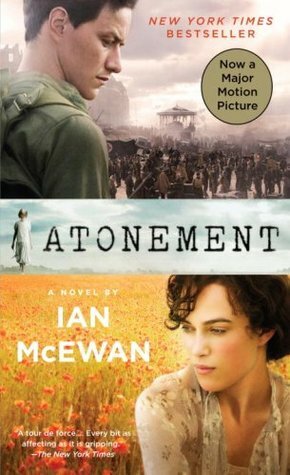 Atonement by Ian McEwan plays with your mind on so many levels: just as promised in my title, this book is actually about a book. The narrative in that book changes someone’s life; it draws from many different narratives set in the real world’s story, one of wars and people sucked in by the conflict. Confused? Let’s just say it all starts innocently enough: Briony, a girl of about 13, loves writing plays. She comes from the wealthy Tallis family who have just grown into a larger household. Their cousins, the Quinceys, come for an open-ended stay as a result of trouble between their parents (relatives of the Tallises). Sometimes playful, and sometimes darker chaos ensues between the younger ones as they attempt to perform Briony’s play ‘Trials of Arabella’. Meanwhile, we also saunter into the narrative of Cecilia Tallis (Briony’s older sister), who senses the romantic tension between her and Robbie (a childhood friend, but also the son of a servant at the estate). One fateful hot night, the paths between their stories and realities cross. Briony’s misunderstandings about adult motives and an overimaginative mind frame someone near and dear into a sinister crime, which will have a lifelong impact beyond her imagination. For such a crime, will she ever reach “atonement”? A first-person account from Briony. Why I think this was done: Just like Othello by Shakespeare, I think this gives us an insight into how a few words can change a life. Considering the tense sociopolitical situations of the time, words truly could start a war, change the future. This links to the historical context around WW2; Elizabeth Bowen, Rosamond Lehmann, and Virginia Woolf are influences in Atonement. Like Catherine Morland in Jane Austen’s Northanger Abbey, Briony misjudges what is happening in a most romantic way. Like Othello, she has to spend her whole life finishing a story she didn’t even realise she trapped herself into belief forces you into accepting a certain view of things. 1. World War 2 is evidently the biggest historical event during this novel. The evacuation of Dunkirk was seen as a failure by some, a success by others – it could imply a time of mistakes and retreat parallel to Briony’s own mistake, and consequent atonement. It’s an atonement set in a society that desperately wants to atone for the disillusionment after the war. The 1930s was also a time between the two Wars. If you’ve read An Inspector Calls, you’ll know that this could suggest a time of change/hope. Similarly, you could draw parallels within the Tallis household (see the theme of change below). Everyone during war-time would also endeavour to ‘help the war effort’. Perhaps Briony’s decision to accuse Robbie is an aftereffect of not only her fantastical literary idols but also the war effort to find out spies. 2. Social class hierarchy. I think social class could have played a role in Briony thinking that Robbie, not P. Marshall, was responsible for assaulting Lola. Similarly, Robbie thinks Danny Hardman (a lower class than him) was responsible for the crime, highlighting the social tensions of the time. 3. Women getting much more freedom; a theme evidenced by Cecilia’s unstereotypical behaviour: smoking, wanting a proper degree etc. 4. All of this comes under the theme of MODERNIST WRITING. This was a movement that embodied the breakdown of morals, the disillusionment in the aftermath of WW2. A false narrative viewpoint is set up in Atonement, whereby we think we are listening to an omniscient third-person narrator, whereas we are listening to Briony’s account. My English Teacher (the mysterious and helpful figure looming over many of these blog posts) describes it as ‘Believing is Seeing’. Briony believes that Robbie is the criminal, so Robbie’s maniacal tendencies become a part of her memory, something she has seen. Similarly, we as the reader believe that everything the narrator says is true; we see Robbie in the war, Cecilia in the green dress, Briony as the ‘tireless primadonna’. At the end of it we’ve been gobsmacked with the news that it was a facade – in fact, it was Briony’s own account. Now we’re the one questioning the reality, just like Briony during her atonement. I think by the end, we come away with the realisation that we will never know the objective truth. The fact that the narrative itself is so subjective forces us to consider our entrapment. Ian McEwan is an atheist so the injustice that happens to Cecilia and Robbie, and the ill luck of everyone else involved could aim to emphasise the brittle realities during war-time. Change. Whether it’s peace to war, childhood to adulthood, innocence to corruption, sin to atonement, all the characters in Atonement are on the cusp of a change.